A new Central Fire Station, Fire Administration, and Emergency Operations Center facility was dedicated October 5, 2018. It honors fallen DCFD Firefighters Captain Ron Weaver and Sergeant Steve Townsend and Del City native US Army Captain Michael C. Hope who was killed in action in the Vietnam War. New business, assisted by the city, to locate here in Del City at I-40 & Sooner Road. New businesses, assisted by the city, to locate here in Del City, including Ted's, Volcano Sushi Bar, The Garage, and more. New business, assisted by the city, to locate here in Del City at 29th & Sooner Rd. New business, assisted by the city, to locate here in Del City at 29th & Sooner Road. New Family Dollar Opening Soon! New business development, assisted by the city, to locate in the Del Crest Shopping Center, Del City. New business, assisted by the city, to locate here in Del City in the Del Crest Shopping Center. The Parks & Recreation Department offers visitors with clean, green, and safe accessible open space and an opportunity to fish at Eagle Lake. Take a look around. There is a lot of useful information. Thank you for visiting and we hope to see you again soon. Del City is centrally located in the Greater Oklahoma City Metropolitan with direct access to Oklahoma City, Midwest City, and Tinker Air Force Base. With Tinker Logistics Center, Quad Graphics, and Midwest Trophy Manufacturing as area employers, it's a convenient place to live, work or open a business. NEWS RELEASE: Del City Fire Station #2 on SE 44th Street is closing. No events are scheduled at this time. Please check back soon for new events in the City of Del City. 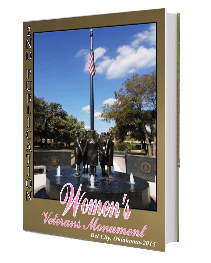 In Memory of Our Fallen Heroes tells about the soldiers from our hometown who made the ultimate sacrifice for our country. 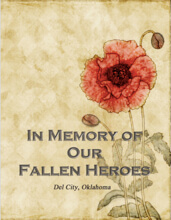 This touching booklet was compiled, designed, and edited by Leslie Mount for the City of Del City.